The independent Local Government Boundary Commission for England is carrying out an electoral review of Allerdale Borough Council. The review will draw new council ward boundaries across Allerdale. The Commission has also announced that 48 councillors should be elected to the council in future: eight fewer than current arrangements. 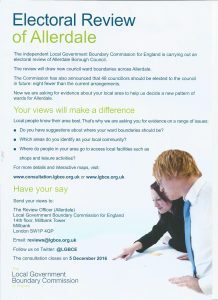 Now they are asking for evidence about your local area to help them decide a new pattern of wards for Allerdale. The consultation closes on 5 December 2016.